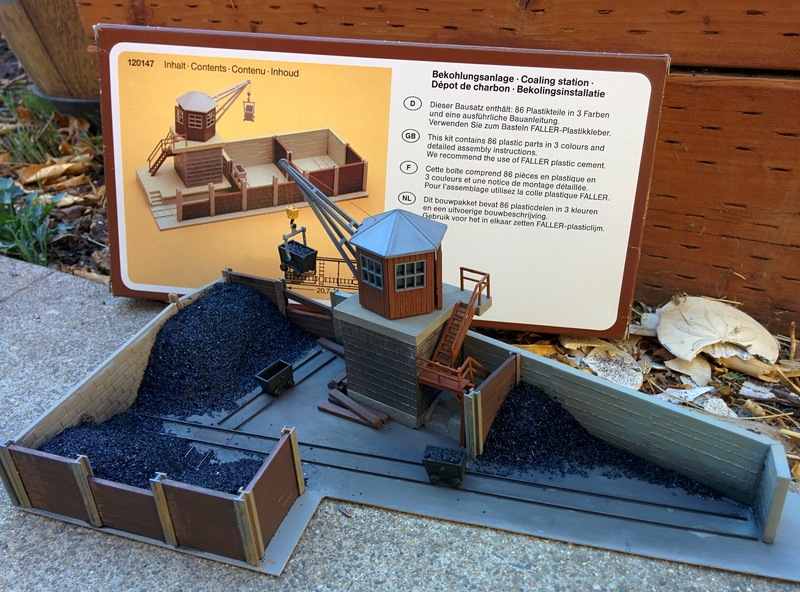 The coaling bunker is at a sufficient level of completeness to put it into the layout and move on. 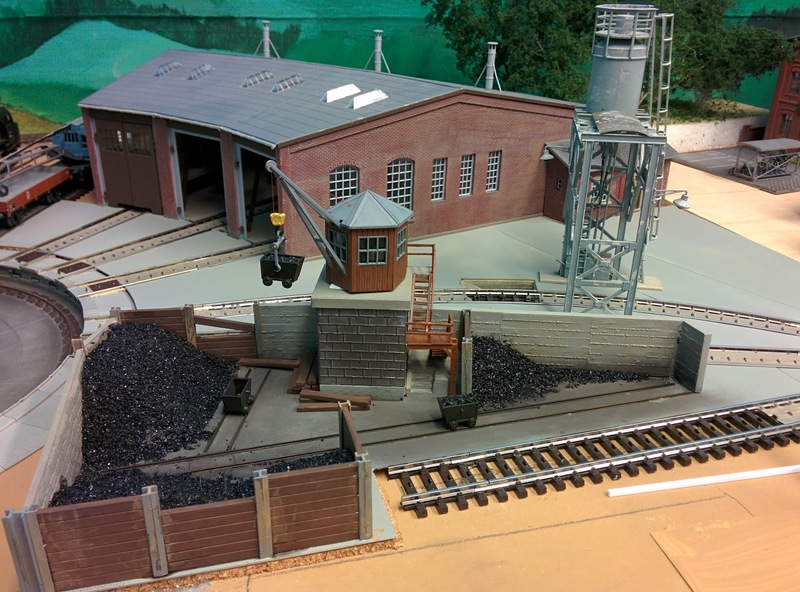 I did some more fine tuning on the coal carts and finished installing the crane hook and rigging. I gave the crane some light weathering to fit in with the rest of the bunker. The service track in the front will be covered up with concrete. Even it it were balasted, I didn't quite expect it to look this weird. I mentioned before this is a kit-bash. Here's my model with the original arrangement on the box. I kept the general idea that the locomotive track is in the rear next to the crane and protected with concrete wall. The wooden wall bits are intended to be lowered and raised as delivered coal fills the bunker. However, since there isn't much storage near the service track I didn't bother to install bunker walls along the track and ran the cart track alongside the service track instead. The wall on the left of my model is made from two pieces of Noch foamwall, that I sliced in half to reduce thickness, glued back to back, and topped with a piece of strip wood to cover the gap. While the coloring of the foam piece was hideous with some concrete color it now matches other concrete brick in the area. Note how I folded the stairs to make more efficient use of the available space. 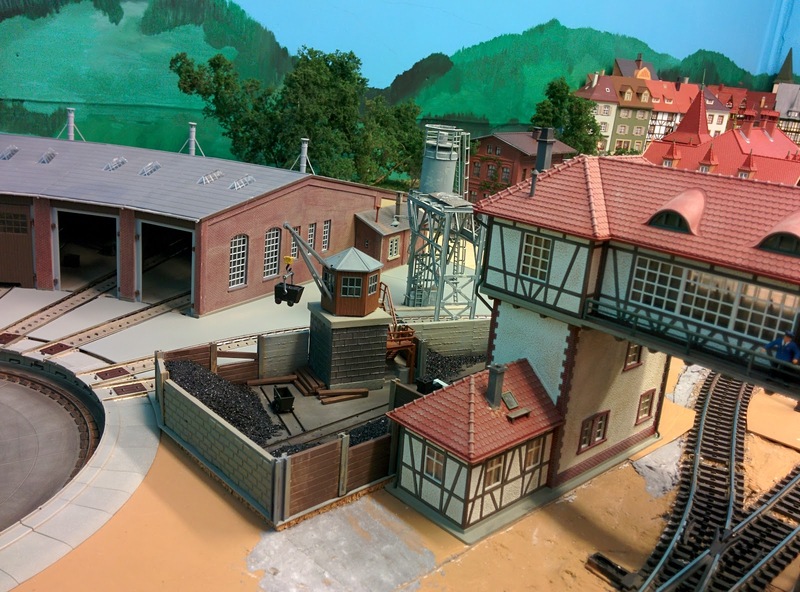 The coaling bunker is boxed in between the turntable, the engine track, and Ef tower. Unfortunately it is somewhat hidden from view behind Ef tower. You can't always win. I'll postpone motorizing the crane until I have a bright idea how to link a motor to the axle of the crane without causing a wobble effect on the crane house, as well as turn it in a way that doesn't make the coal cart wiggle violently along the way.